Fenix Group, one of Italy’s leading manufacturers of aesthetic devices, is pleased to announce the launch of their patented and clinically proven endoSPHÈRES Therapy to the UK market. 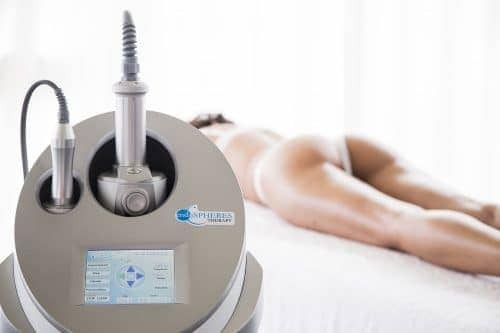 Using patented and unique micro-sphere compression and vibration technology, endoSPHÉRES offers a complete treatment for the face and body targeting cellulite and wrinkles and provides the new standard in fat reduction and body contouring solutions with visible results noticeable after only one session. Using micro vibration and micro compression technology, in conjunction with its design specifics, the patented and FDA registered endoSPHÈRES Therapy Method reworks the principle on which current methods used for body shaping, fat reduction and the treatment of cellulite are based and it replaces the traditional method of “suction-traction massage”. EndoSPHÈRES is entirely non-invasive and pain free and works in an entirely ‘biological’ manner with the unique action of the micro-spheres working the body’s natural mechanisms to break down, remove and re-shape fat and adipose tissue whilst at the same time stimulating elastin and collagen production for a fully toned, sculpted and lifted effect, which up until now, would only have been possible with more aggressive treatment methods. The endoSPHÈRES results speak for themselves and offer a total solution for face and body with all areas treatable including the breasts. EndoSPHÈRES Therapy is based on the principle of Compressive Microvibration that, through the transmission of low frequency vibrations in a range between 39 and 355 Hz, can generate a pulsed, rhythmic action on adipose tissue. The handpiece contains a cylinder that rotates on its own axis, in which 55 antiallergic silicone spheres are installed, positioned in a honeycomb-like pattern, with a specific density and diameter. The direction of rotation and the pressure used ensure that micro- compression is transmitted to the tissues; the frequency – measurable through the variation of the speed of the cylinder – generates microvibration; and the right combination of these forces, together with the time of application, determine the treatment intensity and deliver the results. Through this ‘pulsating compression’ method, fat deposits are pressurised and as a consequence loosen to finally break down, which the body can then naturally remove and allow the re-shaping of the fat and adipose tissue. These spheres also stimulate fibroblasts which are responsible for elastin and collagen production in order to make the tissues smoother and firmer whilst reactivating blood circulation to improve skin tropism and cellular oxygenation. Thanks to the uniqueness of endoSPHÈRES Therapy, the treatment can be repeated over time, and without any contraindications to exposure to the sun. Results are visible after one treatment but for best results a minimum course of 6 to 12 sessions is recommended. We don’t have any salons in Lancashire at the moment but will hopefully in the near future. In the meantime please visit our website http://www.endospheres.co.uk for info on clinics in UK offering the treatment. Would this treatment be any good for lipodaema please which I have suffered from since puberty and which has marred my life quality? Apologies for late reply. Yes Endospheres Therapy can help address lipoedaema as it works on the lymphatic system, improves micro circulation, drains excess fluids, eliminates toxins, eliminates swelling and heaviness in legs, tones muscles and helps to eliminate cellulite. Please refer to our website http://www.endospheres.co,uk for more info.